This weekend, I planted a bunch of perennials in the garden. My garden is very big and my plants are very small, so there’s a lot of empty space left over, but perennials keep coming back every year and they spread out and multiply, so it’ll fill in nicely over the next couple of years. 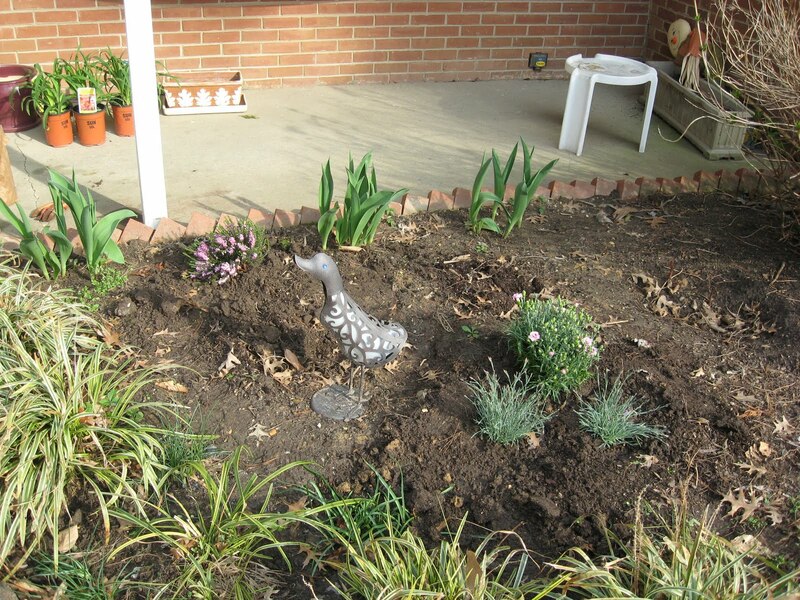 In front, I planted two different kinds of Dianthus (common name: “Pinks”). One is a striped pink-and-red variety and the other one is a shocking pink color. They should look great together once they start to flower. I also put in a heather shrub, because heather smells incredible and once I sniffed it at Home Depot, I had to have it. It’s not supposed to get more than a couple of feet in height, so it should stay comfortable in the front garden. If it gets out of hand like the mutant lavender did at the old house, I’ll have to move it. The shrub is the small pink-flowers blob by the post, behind Solar Duck, and the three Dianthuses (Dianthi?) are in a triangle in front. You can see the tulips are getting huge, also. 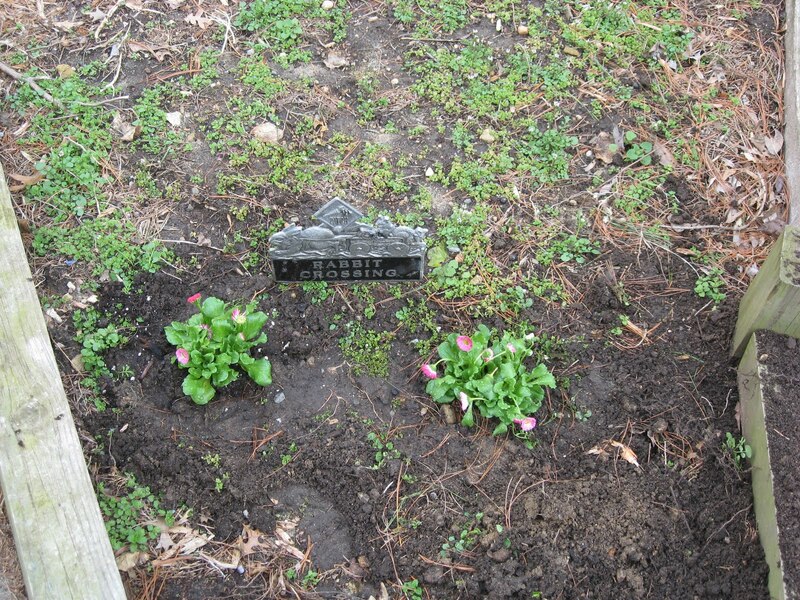 In the backyard, I put in some English Daisies, again in pink. I’m not sure why I bought mostly pink things for my gardens this year! I think I’ll pick up a couple more of them, because those two look lonely. I completely forgot about Mom’s garden “rule of three” where everything should be planted in groups of 3, or at least in odd numbers. 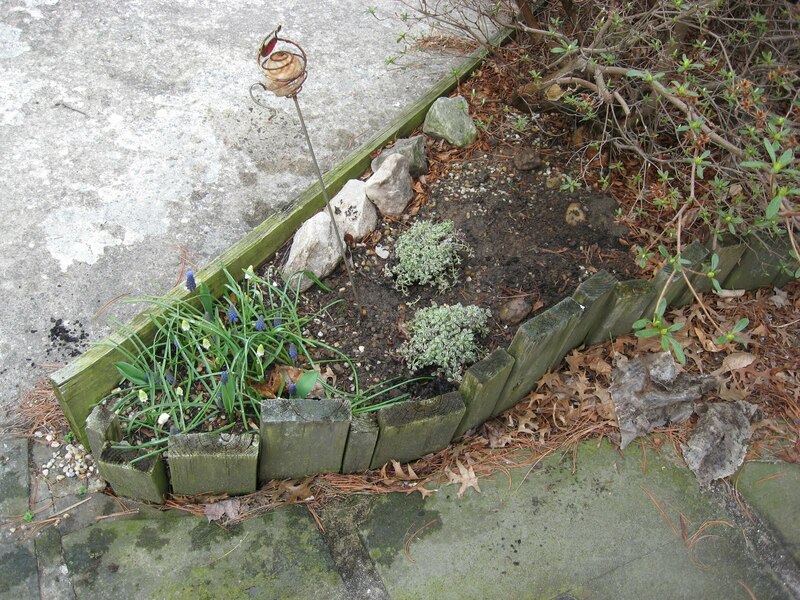 I added Sedum (Stonecrop) to the rocky flowerbed where my grape hyacinths are currently blooming. They’re a nice ground cover and they only make tiny flowers and shouldn’t attract too many bees, which is important since that area is near the back door. I bought some daylilies, but I’m not sure yet where I want to put them. They would make more impact in the front, since people would see them from the street, but I think I want them in the backyard so I can enjoy them from the kitchen and family room. Still deciding on that, and I’ll plant them next weekend. They can live for another week in their little plastic pots. I’ll put up some better pictures of the new plants once they’re settled in and blooming happily! This entry was posted in Uncategorized on April 11, 2011 by antijen.